Chinese writer Chen Wei has been sentenced to nine years in jail for "inciting subversion of state power". The sentencing comes almost exactly two years after Liu Xiaobo was handed an 11 year jail term for the same charge. Like Liu, Chen had published several essays online calling for freedom of speech and reform of China's one-party system. Chen is a veteran pro-democracy campaigner, having been jailed for his part in the student protests in Tiananmen Square in 1989. Just as those demonstrations were crushed by authorities, so too are any efforts to bring about change to China's one party state. Liu Xiaobo found himself on the wrong side of the law when he launched Charter 08 which called for reform. 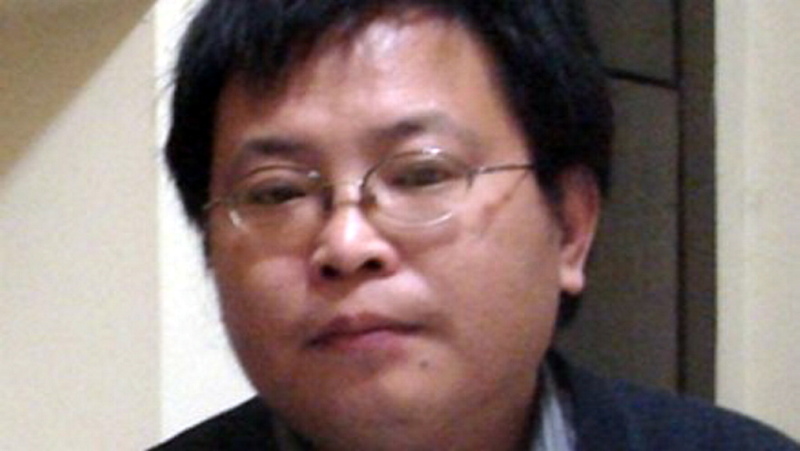 Shang Baojun, Liu's lawyer, has condemned the law used against his client and others like him. "I personally think that this charge is itself unconstitutional. The so-called law of "inciting subversion of state power" is used against those who use rumor, slander [or other means to encourage subversion.]" "The definition of this offence is very blurred," Shang says, "It should be said that enforcing this law is harmful. Many Chinese people have been charged for this offence and imprisoned mostly because of their comments and opinions." Chen was far more vocal and forceful when judgement was passed on Thursday. "Dictatorship will fail, democracy will prevail," Chen proclaimed. His wife, Wang Xiaoyan, echoed the opinions of Liu Xiaobo's lawyer concerning the interpretation of Article 105 of China's Criminal Law. "He is a very patriotic man. He did criticise the Communist Party, but that's stating the facts. That is not subversion," Wang told the BBC. She described the trial as "a show" and a performance. "The verdict had been decided in advance. They don't allow people to speak. There is no freedom of speech." There are many others like Chen and Liu, who receive far less attention. China has rounded up hundreds of so-called dissidents in the wake of online calls for protests in China at the beginning of the year. What are widely believed to be trumped-up charges of tax evasion were made against the outspoken artist Ai Weiwei who himself was detained for a considerable time this year. He like many others were rounded up after the failed so-called Jasmine Revolution, seen by some as an attempt to replicate the Arab Spring uprising in China [BBC]. Those protests were arguably more politically motivated, and were quickly stamped out. But there has been a wave of other protests across China in recent months, inspired not by political dogma, but by very real social problems. Of particular note are the mass protests in Wukan, in China's Guangdong province. Tens of thousands have taken part and battled with authorities over illegal land seizures. The very scale of the protest has forced the authorities to back down and to give in to some of the key demands of the villagers [Sky News / CNN]. But Wukan is not an isolated case. Inspired by their triumph, other protests are being seen. Haimen saw four days of protests concerning the building of a power plant which locals saw as a further threat to their health [Guardian]. There have been clashes with police firing teargas at the crowds. But here again the authorities have made concessions, saying they will suspend the project [Bloomberg]. There are however concerns that despite the back down by the authorities, a backlash may come later. The recent protests could bring about changes in the leadership of the communist party at a local or even national level, which in turn could become more forceful in the way it deals with dissent [Washington Post]. Even those who try to defend the dissidents are victimised. Lawyers who stand up to protect members of Falun Gong, political dissidents or others can often find themselves on the wrong side of the law. Those try to help victims of injustice, often become victims themselves. One such man is Chen Guangcheng. A blind civil rights activist and lawyer he has drawn international attention to human rights issues in rural areas. But that has in turn attracted the attention of the authorities. He was placed under house arrest from September 2005 to March 2006 after talking to Time magazine about the alleged forced abortion cases he investigated in Linyi Prefecture, Shandong Province. Authorities formally arrested him in June 2006 for destruction of property and assembling a crowd to disrupt traffic. During his trial, Chen's lawyers were even forbidden access to the court. On August 24th, 2006, Chen was sentenced to four years and three months for "damaging property and organising a mob to disturb traffic". Chen was released from prison on September 8th, 2010 after serving his full sentence, but remains under "ruanjin" or soft detention at his home in Dongshigu Village. There he remains, cut off from the outside world. Even visitors are prevented from approaching, and journalists are particularly discouraged. Those who do attempt to visit the blind activist are greeted by burly hired hands who make it clear that you cannot pass. Many villagers and supporters have tried to visit Chen, but are often beaten. Media organisations too have attempted, with varying levels of success, to see Chen. The BBC made an attempt to visit the man in November but were immediately swooped upon by three men who "yanked open the car door, barked a few orders and then snatched equipment from out of our hands: cameras, mobile phones and recording devices." CNN also embarked on an expedition to visit the human rights activist. They too failed to get anywhere near the man. They also drew criticism from some for 'making the news' rather than reporting it [BBC]. CNN had been approached by Batman actor Christian Bale who had expressed the desire to visit Chen and show his support. However, CNN's involvement was described by Forbes columnist Shaun Rein as shameful and "a complete failure of journalistic integrity." Asked whether the Chinese government should be embarrassed after Bale was manhandled by thugs guarding the human rights activist's home, Liu said that the actor should feel embarrassed, not China. Whether, CNN crossed the line of journalistic integrity is debatable. Bale may well have tried to visit Chen, with or without CNN's help. CNN merely followed what appeared to be a good story, much in the same way many news organisation respond to tip-offs that something is about to happen at a particular location. It certainly was not the kind of Yellow Journalism some have asserted, though it could be borderline Tabloid Journalism or Tabloid Television. The BBC did not receive a request from a Hollywood actor, but they too could be accused of 'inventing the news', given there was and is no specific event occurring at Chen Guangcheng's home. China has very different news values to those in the west. Investigative journalism is rare, and the reporting of sensitive issues is to be discouraged. Ambush journalism and similar set ups, while questionable, are commonplace in the west. Hidden cameras are frequently used to get the story. And while the use of a Hollywood star in a piece is perhaps ill-advised, it was a scoop for CNN. Arguments over the type of reporting also detract from a very real issue, that of human rights in China. The CNN report, while perhaps sensationalist and exploitative, has served to highlight the appalling lack of human rights in China and the way the country attempts to cover up its dirty secrets by employing thugs to hide them.